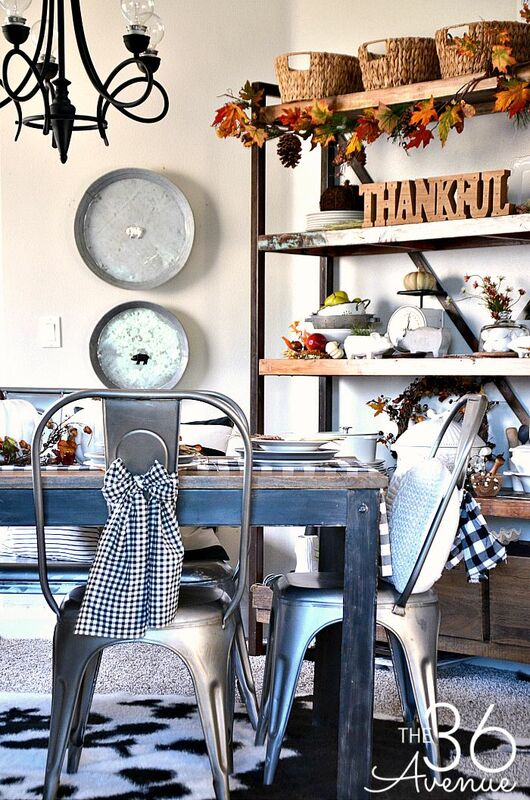 How to decorate for fall with things you already have is a lot easier than you may think. 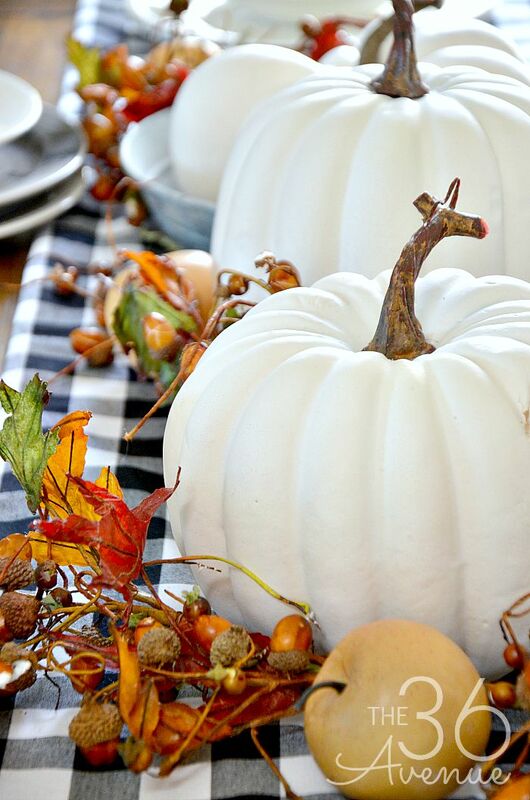 Fall decor is all about creating an inviting and warm feel around your home. 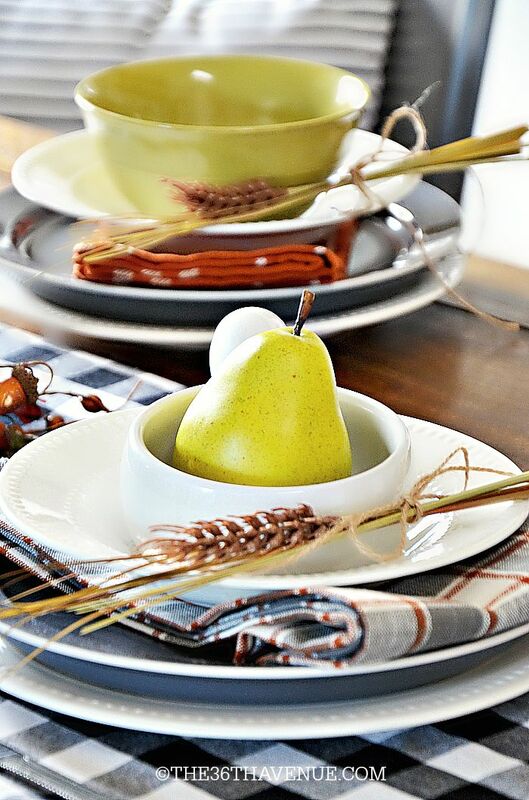 It is that time of the year when you can’t go wrong bringing the beautiful outdoor fall colors indoors. 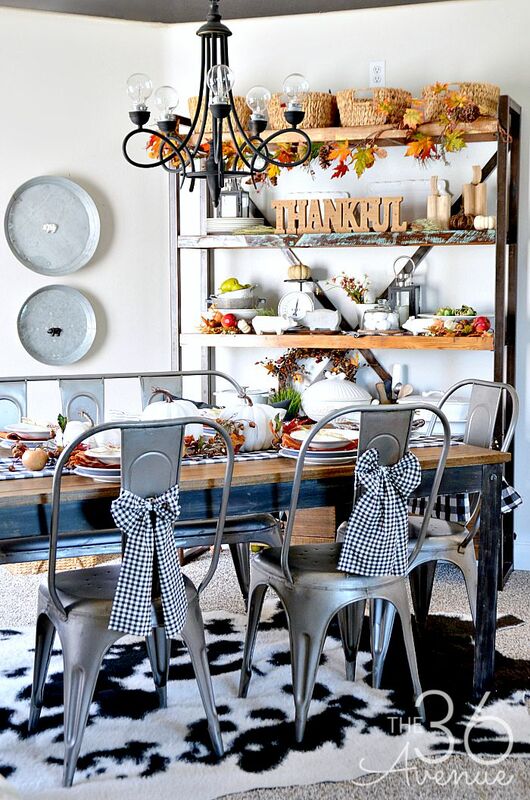 Today I’m opening the doors of our own home to share with you our Dining Room Decor for fall. Let’s take a tour together! I personally love to mix traditional elements with a bit of a modern touch. 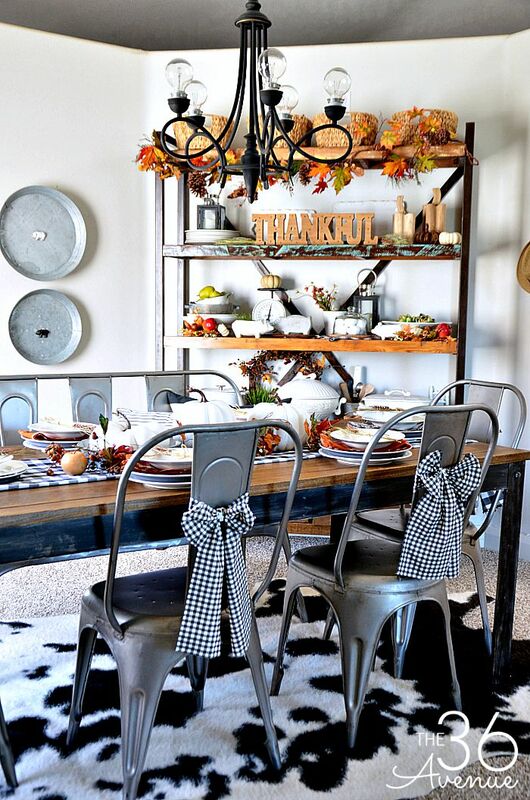 For our dining room this year I used the classic fall colors together with bold black and white patterns. 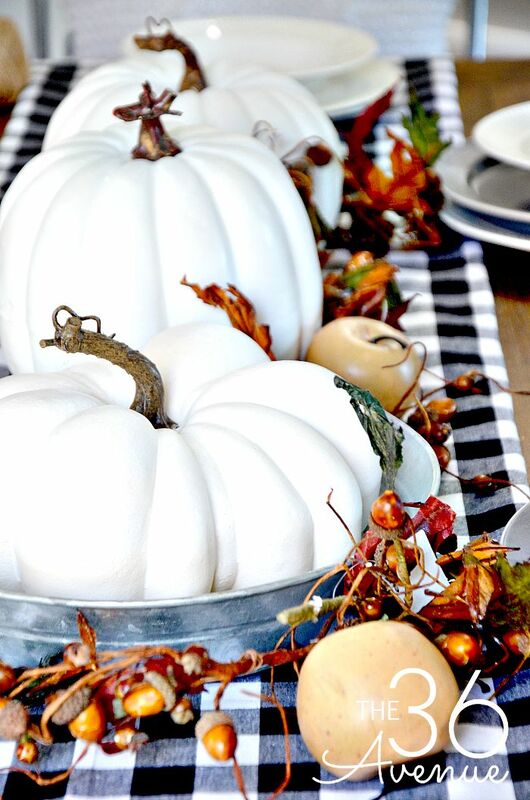 For our Fall Center Piece I I spray-painted a bunch of old pumpkins. 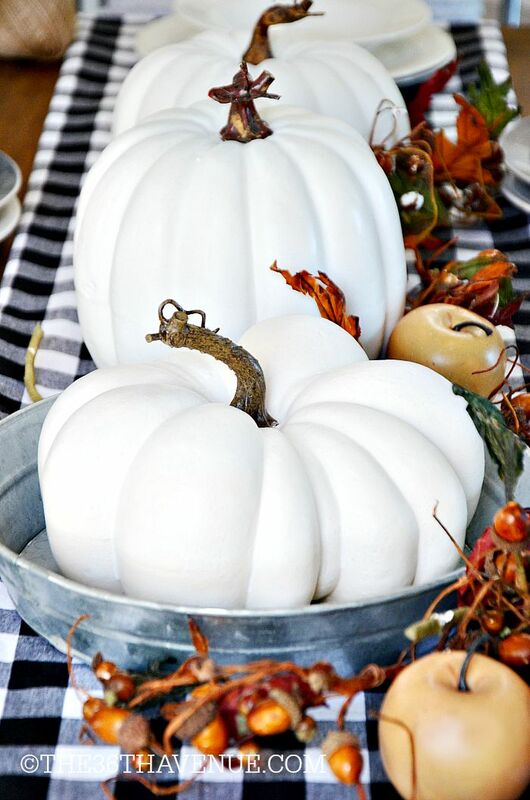 Let’s just say that these pumpkins have seen better days but now they look like brand new again! I love decorating with white during any season. White dishes are timeless, food looks great on them and you can pair them with any other color through out the year. 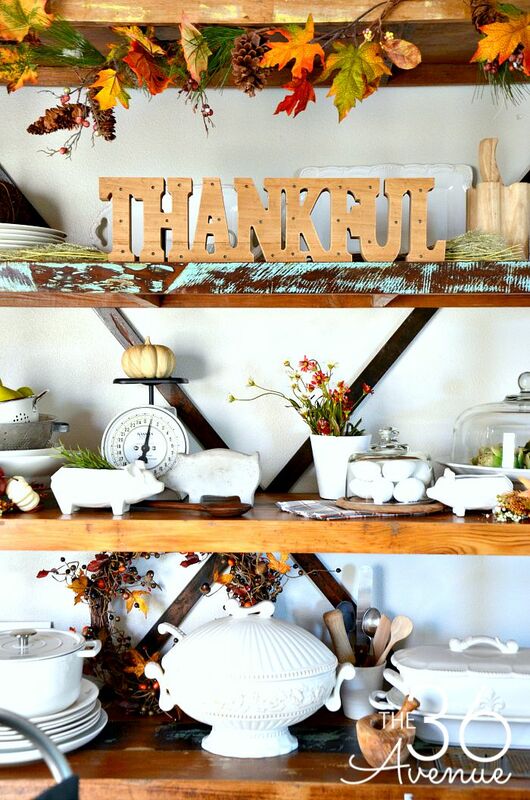 Besides the dishes I also used a fall garland, wreath, and wooden fall accessories to finish our open shelf. Fabrics are simply awesome! 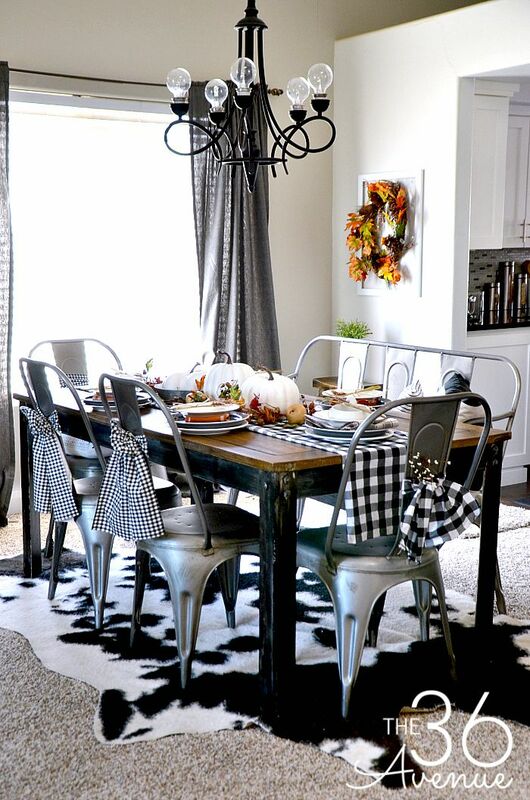 This time I chose my all time favorite black and white buffalo print to bring a pinch of fun to the table! The ” table runner” is actually a piece of fabric. I folded it in a way that allowed me to hide the edges. 2. I like to use and reuse my fabric time after time for different projects. I also used similar but a smaller pattern fabric for the side chairs. I simply cut strips long enough to tie a bow on the back of each chair. Again, I didn’t sew a thing! The different size of prints add additional texture and dimension to the space… Isn’t it cute? Have fun creating layers of cuteness! 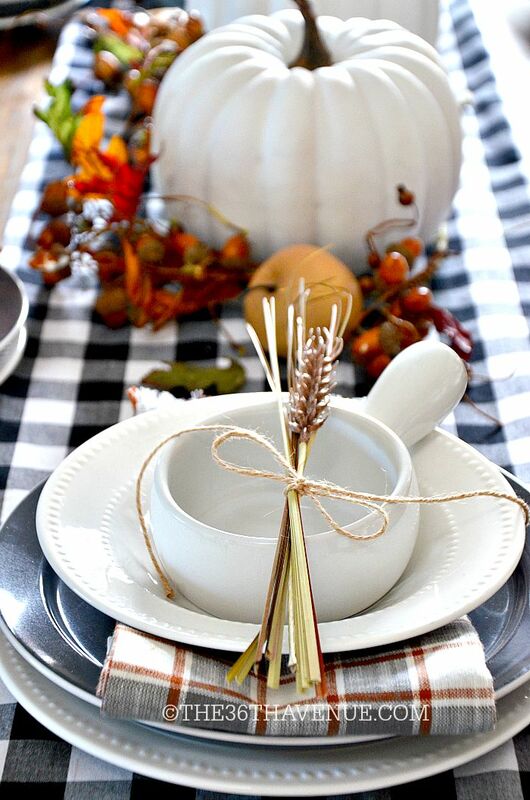 You can add flowers, name tags, or a small wreath to the back of your chairs. I always say that the small details are what transform the ordinary into extraordinary! This is going to sound crazy but I actually like when my dishes are not part of a set! 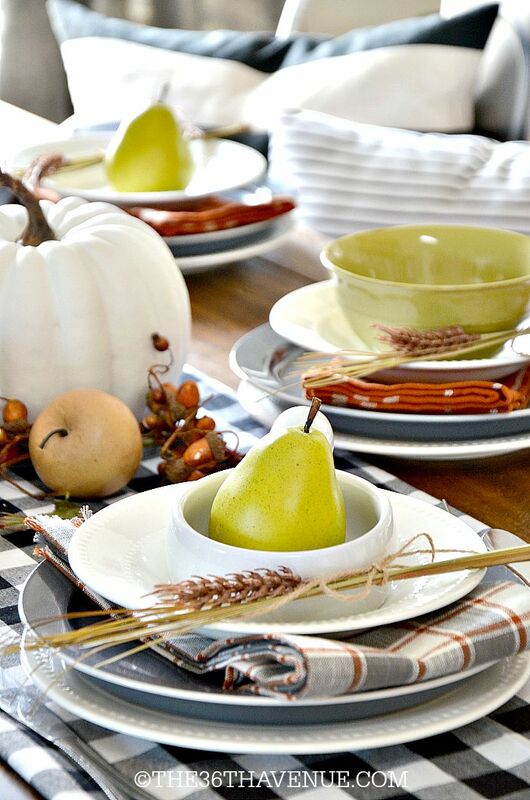 Don’t be afraid to grab different pieces to create the perfect table setting! Whisper voice: Can you believe I found the white plates at the Dollar Store? To add color to a table I like to use fruits, flowers, or any natural element that will compliment the rest of the decor! Remember that whatever looks good in nature will look good in your own home! Bringing the outdoor indoors is a for sure way to create a design that will look not just good but great! If you are going to use “fake” flowers or plants make sure they look as real as possible. I found this bunch at Wal-Mart for $2. 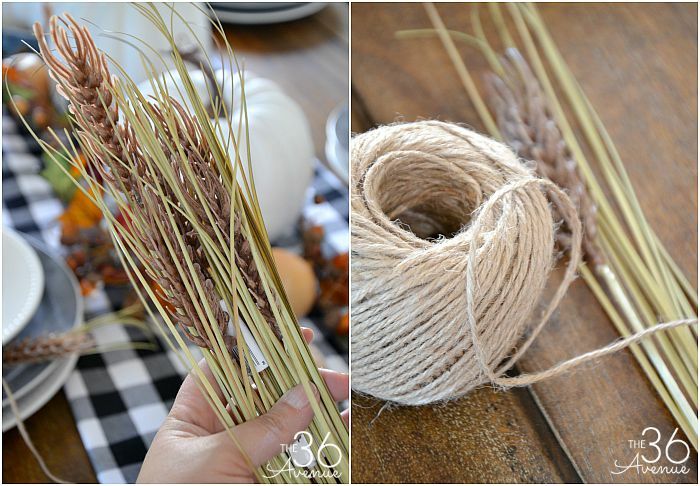 I cut it in six single stems and hold each of them together with twine. Such an easy, quick, and affordable idea! At the end of the day the most important thing is to share a space that you and your family love! I am indeed thankful to have a place to call home! 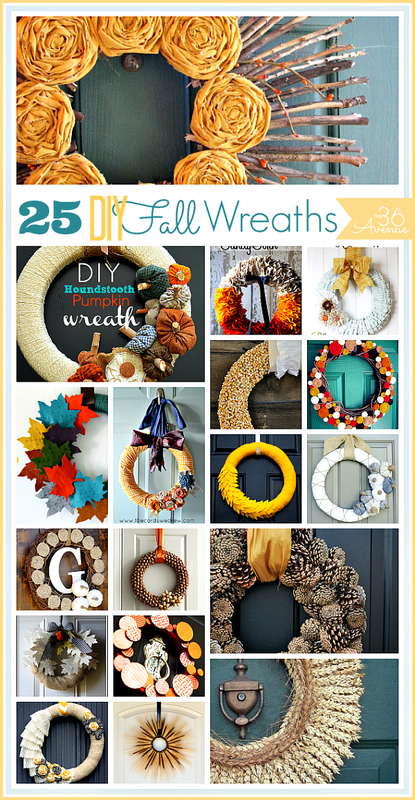 Before you go let me share with you some other Fall Decor that I love! 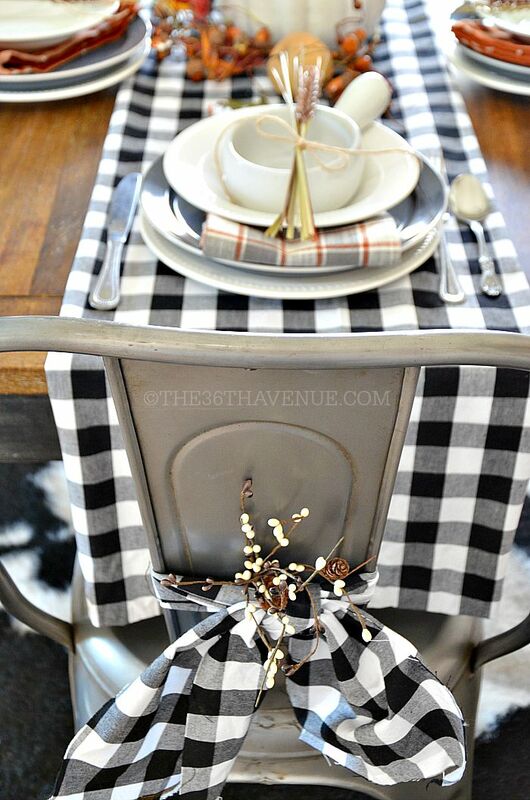 Where did you find the black and white fabric? 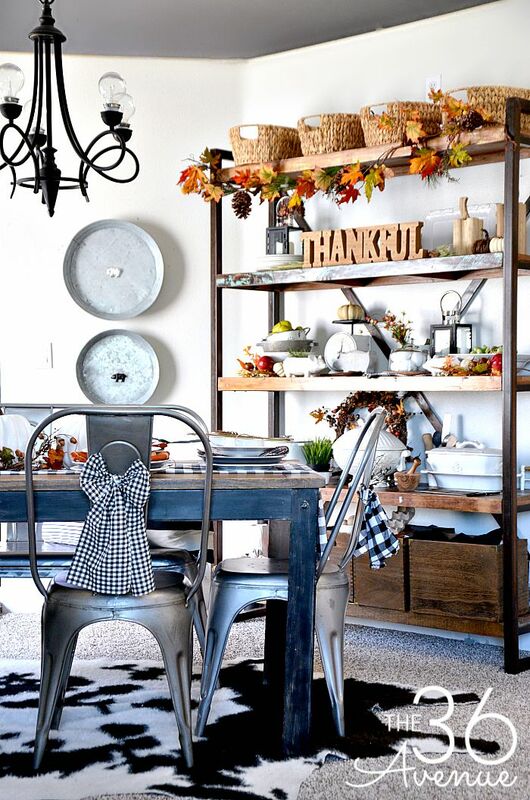 Your dining room looks amazing by the way! I order it from fabric.com online… I hope this helps! Simply gorgeous!!!! 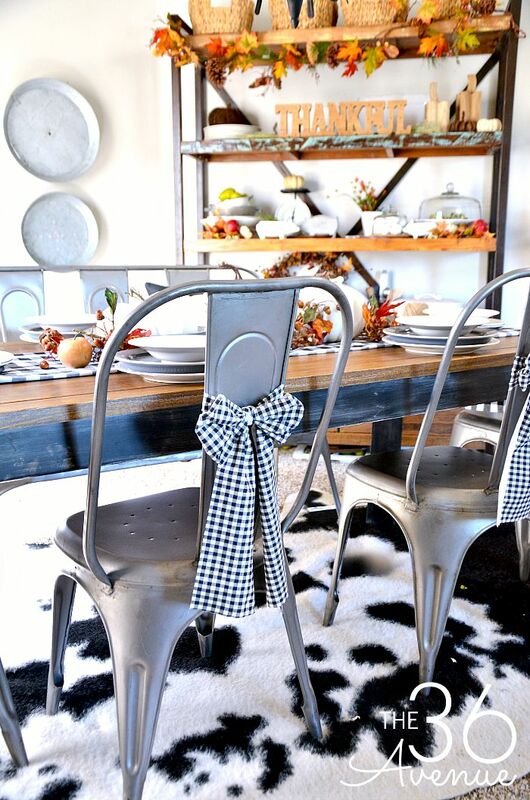 I just swoon over that buffalo plaid.